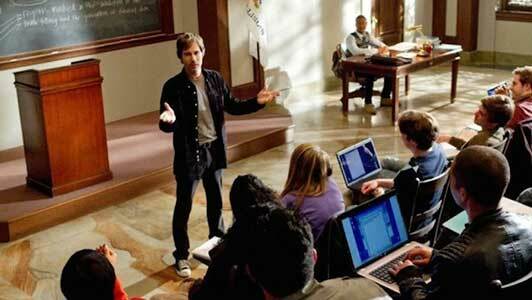 Eric McCormack wears black and navy blue high top Converse “Chuck Taylor” All Stars in the series. 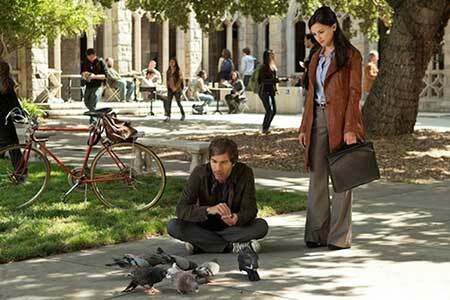 The cast of Perception: Eric McCormack, Rachel Leigh Cook, and Scott Wolf. Perception, a wildly exciting and humorous crime drama airing on TNT, is a show about eccentric and brilliant neuropsychiatrist Dr. Daniel Pierce. Played by the ever-dapper Eric McCormack, Daniel acts as a modern age superhero, teaching at the Chicago Lake Michigan University by day and assisting the FBI by night. Though he possesses no magical abilities, his knowledge is nearly superhuman, and like all intense, interesting superheroes, he also holds a dark side at bay deep within him. His work with neuroscience stems from his own complex history of paranoid schizophrenia, interwoven with fits of hallucinations and paranoid delusional episodes. His mental struggles cause him to lash out at times, giving him the tendency to express irrational and potentially dangerous characteristics. Despite these, Daniel seems to be able to use his abilities and “gifts” to help him make unbelievable connections while solving crimes; he considers his hallucinations a blessing as they allow him to make connections he cannot otherwise see with the conscious mind. Kate attempts to get Daniel to focus on a case. Like with all eccentric, deeply gifted heroes, Daniel’s psychic conditions and quirky, unpredictable manner render him a bit of a loner, and make it difficult for him to establish long lasting friendships or relationships. However, he does strike up a strong connection with Kate Moretti (Rachel Leigh Cook), his closest ally, an FBI agent who tends to go a bit “off book” when completing assignments. She used to be a student of Daniel’s, and developed a crush on him when younger. Together with Daniel’s teaching assistant Max Lewicki (Arjay Smith), she helps root him in the real world, keeping his hallucinations and reality separated and in control. Daniel speaking with one of his hallucinations. Daniel listening to music and trying to solve a problem. The show strikes a vivid, powerful balance between complex, mind-bending matter and fun, fast paced action. In all dark clothing, complete with high top black or navy blue chucks, Daniel runs around Chicago, solving crimes and staying one step ahead of his dark mental condition. The show has a touch of quirky, sarcastic humor to top off the darker, more intense scenes, and to provide comic relief when things get just a little too severe. In the second season’s finale, Daniel leaves Chicago for Paris, realizing that the Chicago Lake Michigan University’s staff and faculty does not have the same compassion and care for their students as he does. Seeking a more enticing environment for him to lose himself in, Daniel flies across the Atlantic to France, giving the third and final season a global and more exciting edge to it. The show, regardless of its location, is a nonstop mess of action, emotion, and psychological thrills. At the end of the final season Daniel returns to the university in Chicago, continuing to work as a consultant for the FBI with Kate and her ex-husband Donnie, (Scott Wolf) who is now with the District Attorney’s Office in Chicago. Daniel giving a lecture at the Chicago Lake Michigan University.